This weekend I’ve finally started work on a new personal writing project. It’s something I’ve been mulling over for a while now, but somehow I’ve just been too busy to get started. After all, I do have an eight-week old baby (quick update – he’s 20 months old now), client work and other bits and pieces vying for my attention. But these “good” excuses were just a cover up to make me feel better about what’s really stopping me. You see the truth is, I’ve been bitten by a bout of writer’s block (yes, it happens to professional writer’s too). And it’s no laughing matter. I know that writer’s block sounds innocent enough. But the reality is very different. It’s made me procrastinate and delay getting a new idea out there – after all, it’s not easy to push through the blockage. And as a result, my profit potential has been harmed. For me writer’s block arrives because of fear – fear that what I write won’t cut it. And that fear is tangible. After all, the words that end up on the page are part of me – and that can leave you feeling vulnerable and exposed to criticism. Can you see how clever writer’s block is? It plays on your fears and can stop you dead in your tracks. In addition, it can add costly delays into your business plans and it can wreak havoc with your confidence. It’s no wonder so much business writing never makes it into print… What you need is a strategy. Here are seven ways to help ensure you get that first draft of your blog post, sales letter, printed newsletter etc. out of your head and into black and white. Recognise it – writer’s block takes many forms. So when your fingers freeze, your brain fogs and your pen won’t move, don’t procrastinate. Instead, push through the pain and get something onto paper. Get in the mood – clear away distractions, chain yourself to your chair and just write (or type). Set yourself a time limit – if that writing task is freaking you out, set the timer for just 15 minutes, and then write yourself silly (and once you’ve started, I bet you won’t want to stop). Write without criticism – don’t let your judgemental mind hold you back. Instead allow your imagination to explore, keep writing and get the bare bones onto paper – it can be cleared up later. It’s natural to doubt yourself – so just push on through the doubt and let your ideas flow. Don’t aim for perfection – there’s a time for perfectly polished sentences and it’s NOT now. And remember – anything goes – bullet points, lists and scribbles are perfect for getting into a flow (and then watch what starts to take shape). Do let me know how you get on. 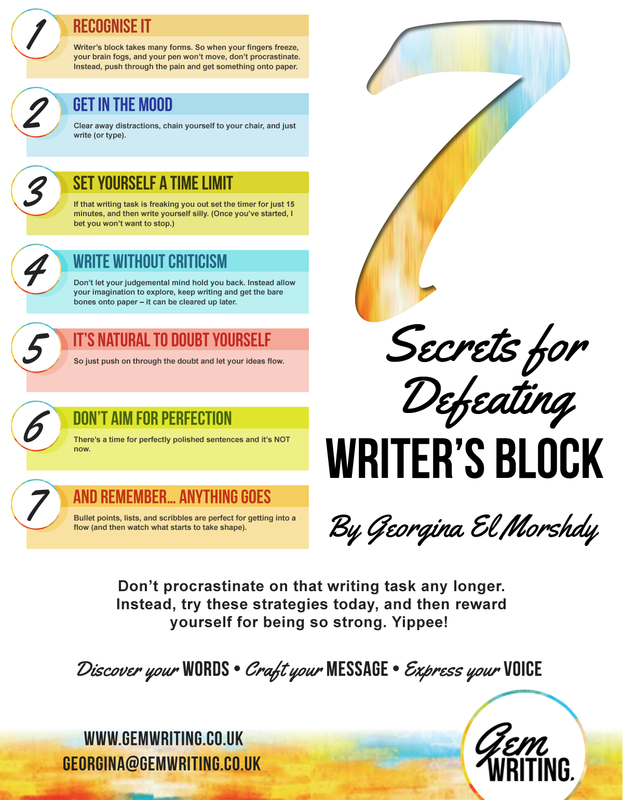 Just pop a comment in the space below and tell me how you’re defeating writer’s block. I’d love to know more about the written nuggets you’re creating for your business. 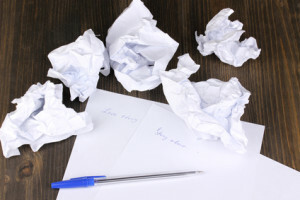 And if you’re wondering whether a professional copywriter gets writer’s block – ABSOLUTELY! In fact, procrastination (and a bit of self doubt) has most definitely got in my way of creating infoproducts. But when you can push through the pain and get your ideas onto paper, something AWESOME happens – you create words that make a difference and that make you proud. In fact, that’s exactly how I feel about my Write Your Own Leaflet Kit – you can discover all the details right here. So if you have a project that needs some compelling words that are struggling to make their way from your head onto paper, do yourself a favour and print off my FREE poster. Call it a simple reminder of how you can make stuff happen. Good news! I’ve created a downloadable poster of these seven strategies for you to print out and pin-up. Simply click here to download your FREE copy now.